• A Personal Development Primer And Self Help Ebook. A Personal Development Primer covering Self-Help and Self-Confidence. Acting successful makes you more attractive. The more attractive you are, the greater your self-esteem. The greater your self-esteem, the more successful you become. The more successful you become, the more attractive you are! All of these attractive qualities are interlinked. Gain one of them, and you can gain them all. "The Book Of Power!" will show you how. Other books just focus on a single aspect of your life. 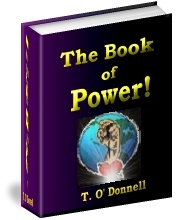 "The Book Of Power!" is a personal development plan, covering self-help, business strategy, how to attract a woman or man, weight loss and beauty tips. BONUS: The ebook is crammed with classic texts on war, politics, diplomacy and strategy. Complete books by famous authors are included. Act NOW to Win Love, Friendship and Security! Exciting tips on how to attract a woman or man. Practical beauty secrets for men and women. Learn how to keep fit and lose weight comfortably. Time now: 09:31:56 | Friday | April 19 | 2019..